I’m diverting from II Corinthians because at the moment you’re reading this I’m on the high seas for a 3-day cruise but thanks to WordPress I can schedule this story and at the appointed time [I hope] it will be told. 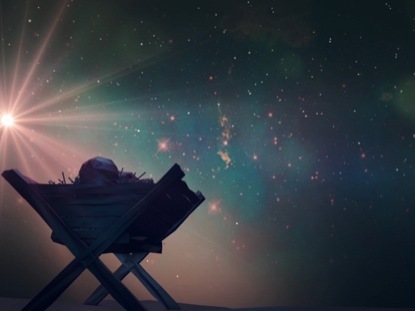 Thank you Lord for the image of “your” new life, your Son, lying in a Cradle of circumstances. This time of preparation shows us how important this annual pilgrimage is to our celebration of that birth and that Cradle. It was your own preparation for us that made Advent a celebration at all and Jesus your special gift of access for us. • We have wise men today that have found their special path to that Cradle to offer their treasure and then share their story with us so we can follow and find our way too. • We have shepherds today who despite their own fears rise and boldly share your Story. • We have angels in our lives who sing your praises and share your promises of renewal, restoration and grace that prepare us to recognize and receive your gift of forever…again this year. It’s glorious to remember isn’t it? This entry was posted in Advent, Sunday and tagged Access, Cradle, Gift, Journey, New Life, Preparation, Remeber. Bookmark the permalink. Becky Speer on He is Risen Indeed!